Izod IndyCar Series applique. Izod IndyCar. Series applique and IndyCar print on leg cuffs. ~ Boy's Firestone Indy Car Series Outfit ~. Firestone Racing. collar snap. Jacket features a leather look with a. 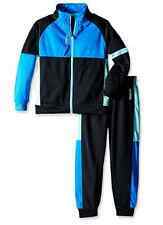 Brand new with tag a.x.n.y Boys' Little 3 Piece Textured Suit Set. In black size 2T. Fast Shipped with USPS Priority Mail. Scooby Doo Toddler Boys Two Piece Short Set. Size: 2T Boys. Type: Pants and Top. Sleeve Style:Long Sleeve. Size: 2T Boys. Type: Sweatshirt and Pants. Material: Cotton Polyester. Coordinating fleece (upper) trim bib with adjustable shoulder. D-ring lift ticket holder on bib. Filler 100% polyester Bib Pant 126 - C - 754 - size 2T - 192334415466. Do not iron Bib Pant Lining for hood, upper body, lower body & sleeves 100% polyester. Your little guy will earn rave reviews for his handsome style when wearing this infant and toddler boy's dress shirt, necktie, vest and pants ensemble from Jonathan Strong. This classy outfit begins with a long-sleeve dress shirt and a comfortable plaid clip-on necktie. The striped vest layers on top featuring a classy pocket square that matches the necktie. Elastic-waist pants round out this formal outfit for a polished and dapper presentation. Machine Wash. Full front zip color blocked jacket. Jogger style pant with color blocked sides. 2 piece set.